A case of increased lead absorption and poisoning in a potter and her family members was reported in the New York State Journal of Medicine, Volume 91(7) 1991. A. Fischbein, et al, described a case in which an artist and her daughter manifested significantly elevated blood lead level concentrations - 48 and 54 µg/dL respectively. The mother, father, and child exhibited abnormal activity of ALA-D, indicative of a lead-associated effect. 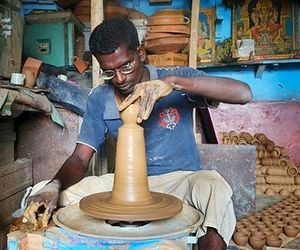 The patient was a 35-year old potter who has worked for 17 years in her field. A change in the label on a glaze product, mentioning potential lead hazards, prompted the woman to seek medical attention. The potter air brushed glazes containing fritted lead onto ceramic tiles. She reported often feeling a "air mist" as she sprayed, and there was no mention of a spraybooth for this activity. She mixed and used nonfritted lead glazes. This woman worked in her studio about 20 hours per week and had frequent skin contact with glazes. While the patient used an Occupational Safety and Health Administration (OSHA) approved respirator (face mask) as protection against airborne contaminants, there was no established safety precautions against accidental ingestion or housekeeping control. The family lived in a 600 foot-loft in which half the area was devoted to the pottery studio. A corridor and a plastic curtain separated the two areas. The patient's five-year-old daughter often was present in the studio while the mother worked. The girl had recently started to spend more time in the studio, and used to touch the glaze and paint her own pottery. The girl was given a paper face mask for protection. The father worked in a field not known for lead exposure. During a five-month period preceeding the examination, he had been assisting with unloading large and heavy objects from the kiln, thus entering the studio area more often. The woman reported fatigue, but no specific gastrointestinal symptoms, associating this tiredness with her long work hours. She reported no sleep disturbances but had experienced slight dizziness. Discontinuation of potential exposure to lead in her studio resulted in alleviation of these symptoms after six weeks. When she applied safety precautions, and phased out all lead-containing compounds, medical analysis proved within normal limits 21 months after the initial visit. However, even at that time, blood lead levels were still higher than those found in unexposed individuals, and prolonged follow-up revealed a continuing higher lead level of 23 [micrograms per deciliter] µg/dL in the artist herself. Fischbein, et al, state that those levels would be of concern to children, pregnant or nursing women, the elderly, or others at risk for lead exposure. This family was lucky in that the health symptoms prompted the mother to investigate her studio and work situation. The article had mentioned her awareness of lead poisoning in an art conservator. Lead glaze should not be sprayed without adequate ventilation. While the mother wore a respirator, the dust mask for her daughter was inadequate since it did not form a seal around the five-year-old's small face. Thus, there were very significant lead exposures for the child. The lead levels recounted are of special interest. The Centers for Disease Control (CDC) has recently released more restrictive guidelines for childhood lead poisoning, and their recommended levels requiring action. While the 1985 intervention level was set at 25 µg/dL, the CDC has set a whole new series of levels at which certain actions are recommended. The CDC is recommending action at lead levels much lower than before. All artists who have home studios, especially those with families, should evaluate their working situation and hazardous exposures. Those who want copies of this new statement can request them from: Lead Poisoning Prevention Branch, National Center for Environmental Health and Injury Control, Mailstop F-29, 1600 Clifton Road, NE, Atlanta, GA 30333. Pottery clay contains silicates that can be hazardous if inhaled. Many low-fire clays and slip-casting clays also contain talc, which may be contaminated with asbestos. Long-term inhalation of asbestos can cause cancer and respiratory diseases. When mixing clay dust or breaking up dry grog, use exhaust ventilation and/or wear an appropriate particulate dust respirator. Pottery glazes also contain free silica, including flint, feldspar and talc. Wear a particulate dust respirator when mixing or spraying glazes. Some glazes also contain toxic metals such as cadmium, lead or cobalt. Be sure to dispose of glazes that contain toxic ingredients as "Hazardous Waste." Toxic fumes and gases are often produced during the firing process. Ensure that all kilns are properly ventilated. In addition, use infrared goggles or a shield to look in the kiln peephole. Proper eye protection will help prevent cataracts.